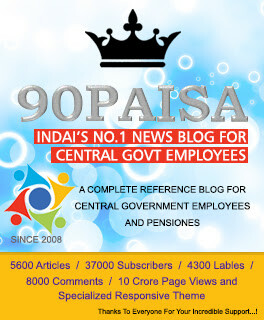 Sub: Grant of Advance – Amendment to Rule 80 of Compendium of Rules on Advances to Government Servants. The undersigned is directed to say that in pursuance of a reference received from the Department of Personnel & Training regarding the demand raised by the Staff Side in the National Council (JCM), the existing provisions of Compendium of Rules on Advances – Rule 80 – relating to Amount of Advances to the families of Government Servants who die while in Service, are retained and amended, as per attached annexure. 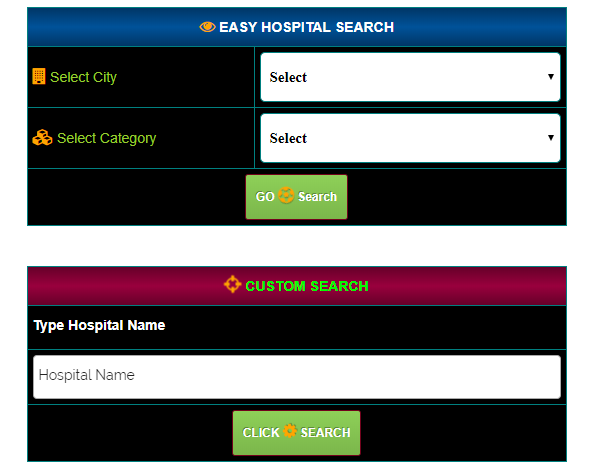 The Union Cabinet chaired by Prime Minister Shri Narendra Modi has approvedthe proposal of Department of Health Research, Ministry of Health & Family Welfare to enhance the age of superannuation of General Duty Medical Officers, Specialist Grade doctors and Teaching medical faculty working in Bhopal Memorial Hospital and Research Centre, Bhopal to sixty-five years at par with doctors of Central Health Services and doctors working under other Central government hospitals/institutes. 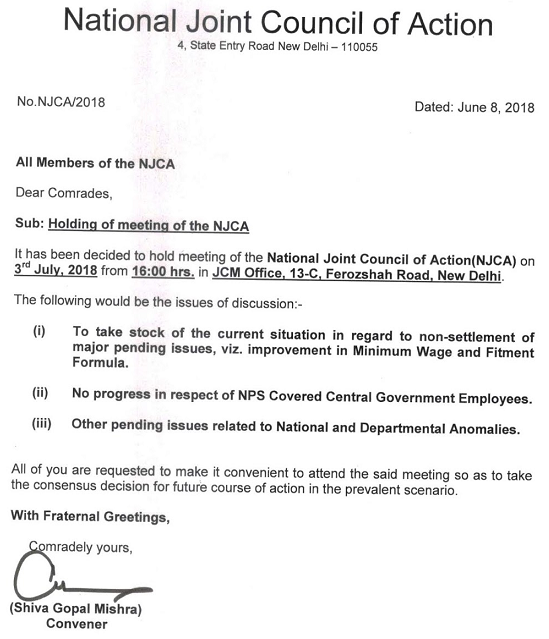 Intergal Coach Factory, Chennai had sought clarification, whether RPF staff are eligible for payment of Ration Money Allowance during their leave period other than Leave on Average Pay (LAP), i.e. Commuted Leave, Maternity Leave & Paternity Leave. 2. The matter has been examined in Board’s Office in consultation with Ministry of Home Affairs. It is clarified that no Ration Money Allowance is admissible to RPF personnel during Commuted Leave, Maternity Leave and Paternity Leave. 3. The other terms and conditions as stipulated in para 4 of Board’s letter of even number dated 10.06.2009 remain unchanged. 4. This disposes off Intergal Coach Factory’s letter No. PB/CBS/RB dated 11.12.2017. We, on behalf of 2.60 lakh Gramin Dak Sevaks of India venture to approach your benign self with high hopes of causing activisation of the process. We are obliged to the union cabinet for approving the implementation of report. But we are sorry to submit that there is avoidable delay on the Part of the officials at Postal Directorate level In issuing orders. Even after two weeks of the cabinet decision not a single order has been processed and even the movement of the file illudes us. Probably, this is aimed at creating trust deficit. Subject: Restoration of pension to Defence Service Personnel who had drawn lump sum payment on absorption in Public Sector Undertakings/ Autonomous Bodies — delinking of qualifying service of 33 years for revised pension with effect from 1.1.2006 reg. Sub: Continuance of “Special Allowance” to Teaching Staff in NVS – reg. The proposal for continuance of special allowance @ 10% of Basic Pay to the teaching staff of NVS including Librarian has since been approved by the Department of Expenditure as communicated vide Minisry of HRD’s letter No.17-01/2017-UT.3 dated 04.06.2018. The Chief Minister of West Bengal has announed today 18% of Dearness Allowance to State Government Employees, Teaching/ Non-Teaching staff of Educational Institutions, Employees of Panchayat and Rural Development, Local Bodies. Current rate of Dearness Allowance is 100% effective from 1.1.2018. From January, 2018 the 10% Interim Relief will be merged with Dearness Allowance. The net percentage of Dearness Allowance will be 125% with effect from January 2019. 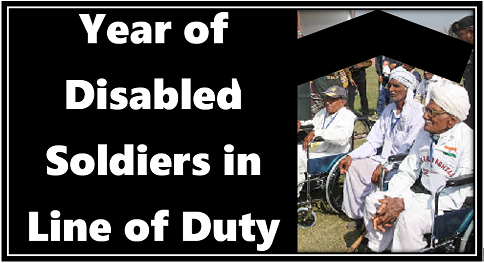 To honour soldiers who have been disabled in line of duty, while serving the Nation and to celebrate the undying spirit of ‘Soldiering’, Indian Army is observing the year 2018 as the ‘Year of Disabled Soldiers in Line of Duty’. The primary focus is towards alleviating the sufferings of these soldiers, who have done their duty with utmost dedication to the Nation and have been disabled for the life. The endeavour this year is to provide a onetime financial assistance to disabled soldiers who have been boarded out from service on medical grounds and are rendered non-employable due to their medical or physical conditions. Indian Army recognizes the inherent stress and strain on such soldiers & their dependents and has well established rehabilitation programmes and beneficiary schemes but these require to be reinforced. The Government is considering proposal of major grant to establish a separate fund which can be further enhanced by contributions from individuals, establishments and corporate sector thus facilitating meaningful initiatives for disabled soldiers. Indian Army plans to create awareness on organizational support available to soldiers and their dependents with respect to medical, rehabilitation, various beneficiary schemes of Central and State Governments, vocational opportunities and assistance for their placement. Indian Army also plans to showcase talent of disabled soldiers by organizing sports and physical activities, cultural events and their art exhibitions. These disabled soldiers have inspiring deeds behind them, hence, it is planned to felicitate them along with selected organizations which dedicate in their rehabilitation. Management of disabled soldiers is an onerous responsibility. Indian Army plans to galvanise due support for the unemployable disabled soldier, his wife and his family with initial financial support to ensure a life of dignity through partially-funded entrepreneurship venture.